As I gaze out over the burning red sky, I am reminded of life’s contradictions. The sky seems to be on fire even as the temperature continues to drop lower into the 20s. The flame of the sky portrays warmth and yet the chill of the air in undeniable. Life is full of things that may at first glance appear to be opposite and yet they coexist (or can) in harmony. It got me to wondering what else could be brought into balance with God’s grace. In this context, a need is something that must be done no matter how much I do not want to do it. These are the less glamorous tasks in life. Sometimes these are small things, like taking out the trash, emptying the cat box, scrubbing the toilet or paying bills. Sometimes they are greater obstacles, like having a hard conversation with a loved one or facing the challenges of caring for someone who is terminally ill. I like to think that someday I will be spiritually enlightened enough to find delight in these activities…but I am not there yet. The list of my wants and desires could fill this whole page, but some fairly consistent ones are spending time with family, working on art projects, walking in the woods and curling up by the fire with a good book. I could fill my days with these activities, but how would I get the bills paid or feed my family? At first glance, how can these contradictory things possibly be brought into balance? I simply cannot visit a sick friend while I am curled up by the fire. I cannot pay the bills if I am endlessly working on my art. But I invite you to look closely and find ways to allow the joy of your wants to spill into the things that need to be done. If I create a piece of art with a sick friend in mind, then I build up my anticipation of visiting them. The joy from my creation spills over into our visit, and I can relive the fond memories of creating the art as I share it and my time with the friend. I can start paying my bills early enough in the evening to leave time to curl up with a good book. The anticipation of the evening by the fire makes the chore of paying the bills pass by more quickly. Make a list of your own wants and needs. 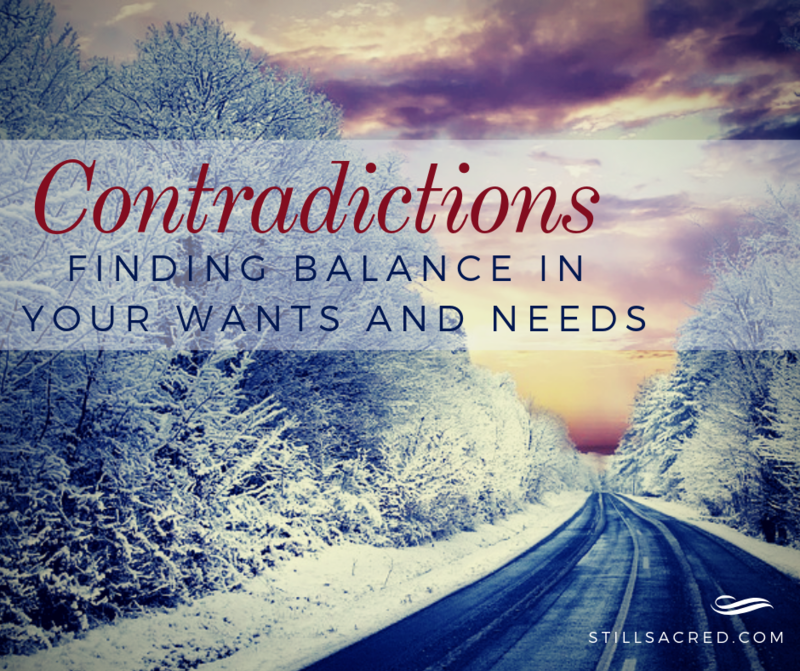 See where you can bring these contradictions into balance to create more happiness in your life. As always, I love to read your stories of how this is manifesting in your life…so I invite you to share them in the comments section below. Free Spiritual Resources – click here to Join the Journey. 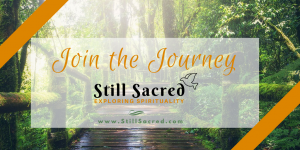 Still Sacred Facebook Group, where you can communicate with others that have also decided to explore spirituality in the everyday moments of life with gratitude and humor. Come join us!